Palazzo dei Diamanti introduces a new space where contemporary and modern art meet. In a newly restored room flanking the main exhibition hall, Offside presents a series of works by international artists that will take a contemporary look at the themes of the exhibitions Courbet and Nature (22 September 2018 – 6 January 2019) and Boldini and Fashion (16 February – 2 June 2019) that will be running concurrently in the main gallery. This idea stems from the desire to broaden the critical perspective through the work of selected contemporary European artists who explore the themes, movements and artists of the main exhibitions either by reflecting on the legacy of the 19th and 20th century masters or by engaging in similar themes from a more complex modern perspective. Creating a reciprocal relationship between historical and present day art broadens and enriches the conceptual boundaries of both. To kick off our program are exhibitions by two artists who have long examined the central aspects of Courbet’s research in their work, Flavio de Marco and Eva Jospin, residing respectively in Berlin and in Paris, and a performance piece that explores the relationship between dance and nature by the Parma-based director and choreographer, Daniele Albanese. Séparée brings to Italy recent works by Nives Widauer, a Swiss artist living in Vienna, whose work has been exhibited in high profile international venues, from the Kunsthaus in Zurich to the Belvedere and Kunsthistorisches museums in Vienna, as well as the Australian Cultural Forum in New York and the SPSI Art Museum in Shanghai. The exhibition, organized with the support of Pro Helvetia, proposes a dialogue and a counterpoint with Boldini and fashion, an exhibition dedicated to the painter from Ferrara who was one of the most famous portraitists of the Belle Époque. The project, curated by Maria Luisa Pacelli, is in fact part of the contemporary art exhibition program Offside, which links the work of contemporary artists with the work of masters from the past to provide a current overview on historical themes and movements, and, in parallel, promote the research of contemporary art through the connection with prominent figures in art history. 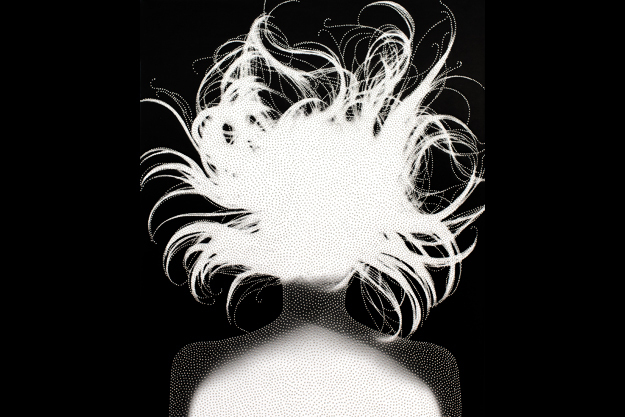 For almost 20 years, Flavio de Marco has reflected on the influence of codified images in his pictorial work, whether taken from the digital media that affects the present day imagination or from the traditional pictorial genres that have set the boundaries of art history. For this reason, his path has inevitably been compared with Courbet’s, a master who has been an example to generations of artists for his revolutionary approach to the academic genres and for his original way of looking at reality. On the occasion of Courbet’s return to Italy, De Marco presents new works which revolve around two pillars of the French painter’s output, the landscape and the figure. 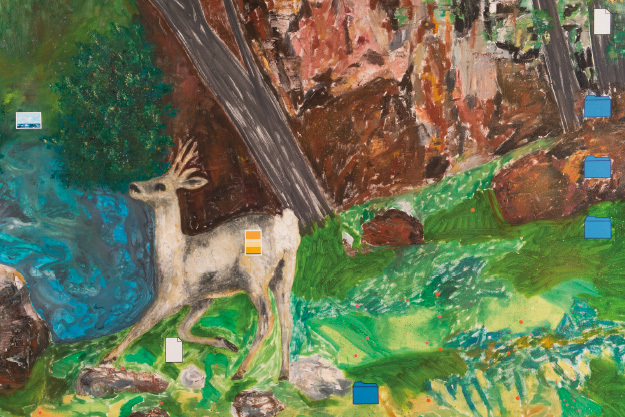 Roe deer at a stream (1868, Fort Worth, Kimbell Art Museum), which will be on display in Courbet and Nature, is used as the background for a pictorial reinterpretation that is hybridized with a digital image. De Marco then taps into some of Courbet’s chosen themes, interweaving historical artistic references with personal experiences through very diverse expressive means: from drawing in coloured pens to “painting on ready-mades,” from the figurative texture to the material texture, up to the geometric abstractions of the digital screen. 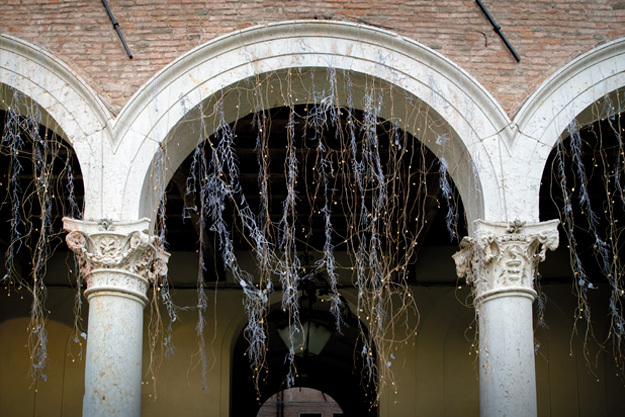 In tribute to Courbet, Eva Jospin presents Ninfeo in the portico of the Palazzo dei Diamanti. This installation will run concurrently with the exhibition Courbet and Nature, while from November 17th, the exhibition Sous-bois will bring together the diverse formal styles with which the artist has experimented to create an enchanted look at nature: from the large woods in high relief that invade the observer’s space, tickling the senses, to the iridescent texture of the graphite on paper with which she evokes the liveliness of the water that gurgles from the rocks, up to the sophisticated effects of transparency in the Dioramas. Dance and nature come together in the site-specific performance, Birds Flocking 2° Studio, conceived and directed by Daniele Albanese, which will take place at the Palazzo dei Diamanti on October 15th beginning at 4pm in the exhibition rooms and finishing with an action piece in the internal courtyard from 7:00 to 7:30pm. 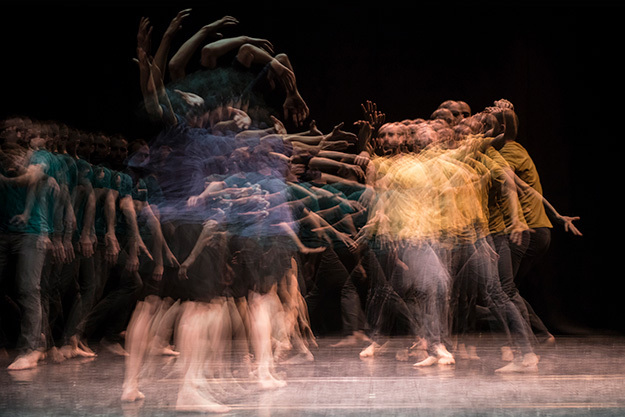 In keeping with Albanese’s research, this performance explores the connection between body and mind within space through dance, finding inspiration within the natural world. It is by observing the extraordinary geometric configurations described by flocks of birds at dusk that gave rise to this project, Birds Flocking 2° Studio. The aerial manoeuvres of the flock, appearing simultaneously random yet organized by complex mathematics, become a metaphor for the interaction between the individual and the group, for the search for a balance between personal freedom and collective responsibility. This relationship is re-enacted by five dancers who come on the stage in the exhibition space, unpredictably, one by one, to converge at the climax of the performance with an intense choral action that bursts into the courtyard of the Palazzo dei Diamanti, offering the viewer an evocative visual and sound experience that is similar to the multisensory immersion that Gustave Courbet sought and lived through contact with nature.